Join us for our Volunteer Orientation! 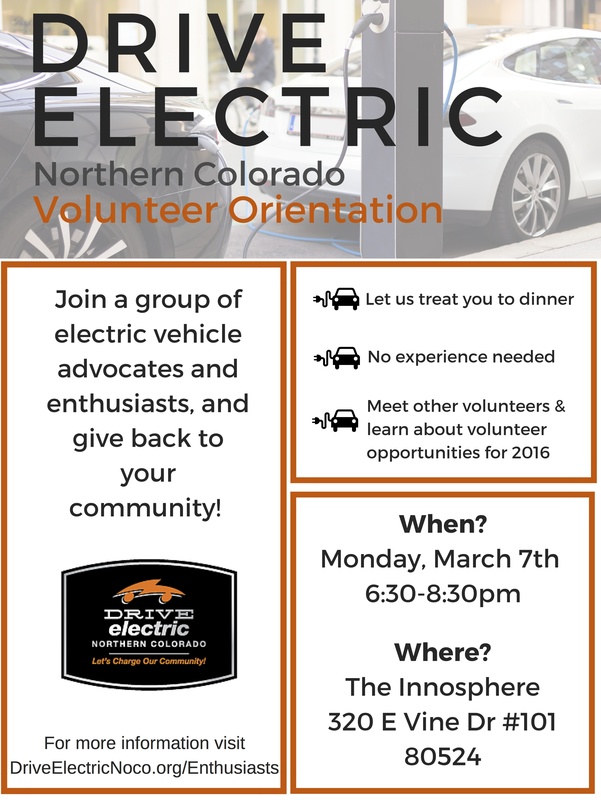 On March 7th from 6:30-8:30pm DENC will be holding a Volunteer Orientation at The Rocky Mountain Innosphere in Old Town Fort Collins. We invite you to join us for dinner, and some EV fun! This evening is a chance for you to meet other EV owners, enthusiasts, and advocates in your area. It’s also an opportunity to join our nationally-recognized program, in anticipation of the coming Ride and Drive event season! Whether you are an EV owner, a tech nerd, passionate about sustainability, or just want to hang out with a group of people working towards improving the community — we welcome you! We have built an incredible network of people in Northern Colorado who are helping everyday to accelerate EV adoption. Please RSVP for this event here. The event is free to anyone interested in meeting other EV owners or learning about volunteering with DENC.